We are proud to announce that Mark Herron, managing editor of OrthOracle, has authored an article on the development of the educational platform in this month’s edition of the Journal of Trauma and Orthopaedics. 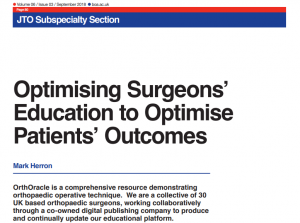 In the piece, ‘Optimising surgeons’ education to optimise patients’ outcomes’, Mark details the origins of OrthOracle — as a solution to demonstrating orthopaedic operative techniques and providing comprehensive education for surgeons and trainees. He also looks at what’s next for OrthOracle, and where orthopaedic education is going. Download the PDF and read the full article here.